Our Wyalusing State Park endowment has reached $5,000!! We are half way to the magic $10,000 when our "acorn" account turns into a full fledged "Oak" account. This is all possible because of generous donations and many purchases from The Bluff Top Concession stand. 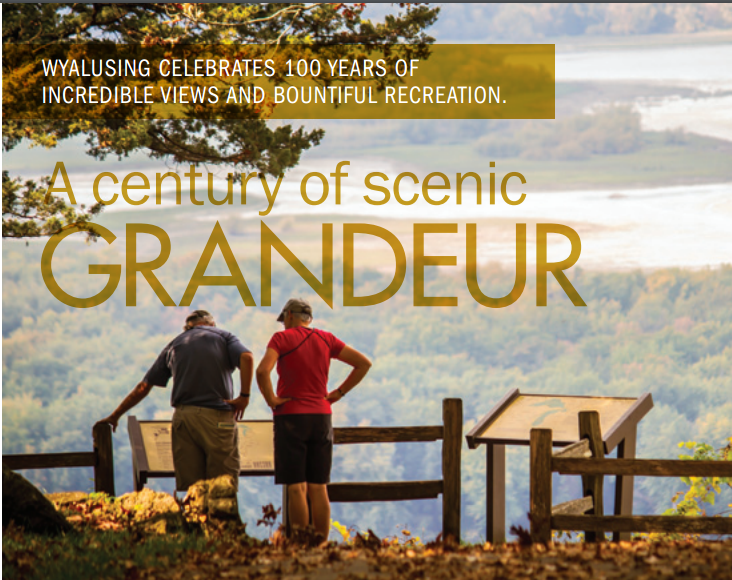 Thank you for your continued support that will forever fund educational and environmental projects in Wyalusing State Park. The Friends of Wyalusing State Park Endowment Fund is a permanent endowment that was created by the Friends of Wyalusing State Park to provide a perpetual source of funding to support the natural resources and educational, interpretive and recreational needs of Wyalusing State Park. The Endowment fund was begun in February of 2009. The endowment is managed by the Natural Resources Foundation of Wisconsin. Contributions to Fund are tax-deductible and can be made by sending a check to the Natural Resources Foundation of WI, Attn: Friends of Wyalusing State Park Endowment Fund, PO Box 2317, Madison, WI 53701 or by donating online at www.wisconservation.org. Click here for pdf Endowment Fund download. Sand cave trail, the newest renovated trail in Wyalusing State Park, is also proving to be one of the best snowshoe trails in the park. The trail is clearly marked with new posts and markers. It is almost three feet wide with a level trail bed. The trail follows the contour of the hillsides with a few steep inclines. The trail is not groomed for XC skiing. The few steep inclines with sharp bends may inhibit all but the advance xc skier. The trail head is located at, what will become, the new interactive nature center (See photo on left). There is a small parking lot which is snow-plowed during the winter. A park visitor will need to have a vehicle admission sticker which can be purchased at the visitor center. While at the visitor center, ask for a map. Click here is view an unofficial (accurate) map. The unofficial map shows the typography. It might be a good idea to let the park staff know of your intentions if you are planning on taking the spur trail to Big Sand Cave. Use snowshoes on Sand Cave Trail. It will be most advantageous if the snowshoes also have a claw plate for additional grip. As of this writing, the snow on the trail has been compacted by this weekend's snowshoers. It may be possible to walk on the trail with lugged snow boots. However, the narrow foot area will also sink into the snow at depth of 12-18 inches, especially when stepping of the compacted trail. 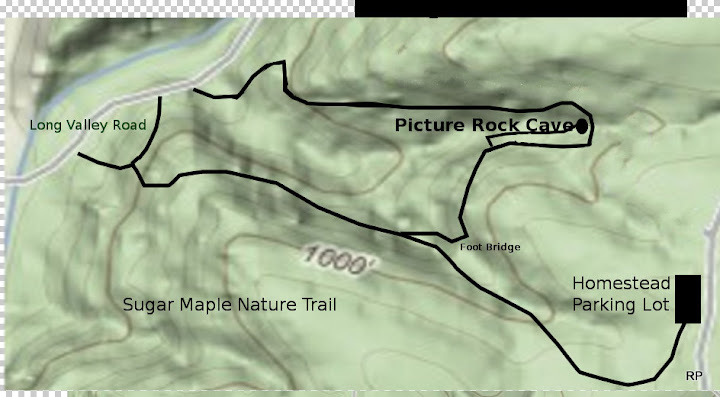 The spur-trail to Big Sand Cave is marked as well. The narrow trail to Big Sand Cave may be a bit harrowing. Stay on the uphill side. Walking on this part of the trail without snow cleats is dangerous. The entrance to Big Sand Cave is strewn with snow covered rocks. Footing is dangerous. As of this writing, the author ran out of daylight and decided to head back to the parking lot. However, it looked as though the trail has been broken in by other snowshoers, at least, until the next turn!